From Pangkor Island : Candle Light Dinner in the Jungle! Getting bored of the ordinary dinner in the restaurant or hotel? At Tiger Rock you can enjoy the natural music of the jungle while sitting by our pool in the jungle. Enjoy a romantic candlelit dinner with your loved one, or celebrate with friends in this special setting. Traditional oil lamps and jungle lighting create a very special night atmosphere at Tiger Rock. Mohan, our manager, can arrange a taxi to pick you up at 5.30pm from your hotel on Pangkor Island. On arrival at Tiger Rock, you will be given a traditional Tiger Rock welcome and one of Mohan's delicious cocktails. For more information, we welcome you to visit Candle Light Dinner While on Pangkor . Our neighbourhood around China Tiger is totally fascinating and there is something to see each time you step out the door. Not only are we in the core zone of the UNESCO World heritage site but there is the bonus of being in Little India. This is a thriving busy local neighbourhood where people are working, setting up business and coming in throughout the day to eat at the restaurants, or to work and run errands in the business district down on Beach Street. China Street is a main vein, like an ancient lei line. Throughout the year we see festivals make their way down our street. At the top of the street we have the Chinese Kuan Yin Temple, and nearby, the Indian Mariammam Temple, and the Kapitan Kling Mosque. In between there are plenty of smaller temples and kongsi's, shrines and mosques to walk by or take time to visit. Depending on when you visit you may see a Chinese Opera, the Chariot being pulled down by the great temple bulls, dancing hoards, a hundred fantastic floats or metallic papers scattered around on the streets. Just on our street there is enough to keep you busy for a couple of days. The Spice Grinding Mill across from us is worth a visit- locals take all their grains or spices there in bulk- and keep an eye out for all the colourfully attired visitors to the Chettiar Hostel opposite us. On the junction with Penang Street we have a fabulous range of restaurants, sari shops and wonderful Indian paraphernalia stores. In the Book Shop Vetrivel, diagonally opposite us they have a wonderful stock of posters of all the gorgeous Indian Gods. Take them home with you and frame them up to create an exotic interior accent. Even the long established Farmesi Mewah is worth a peak- they always have something in there to boost your health and longevity! At the Penang Street junction is our local sundry store, Ramanie Stores and they are stocked with truck loads of stainless steel Indian kitchenware, dried lentils, curry powders, incense galore and best of all, the Himalayan Herbal brand of herbal ayurvedic medications. This brand is Indian and they have the best antiseptic cream on the planet. Scrap your leg, get a spot, stick a dab and it heals you so well. I also love their herbal toothpaste, their Cold Relief Balm and their Pain Balm(for aches and pains). I always love and buy fabrics, and as a visitor it is so tempting to want to buy the wonderful saris. With Seng Hup on Church Street, you can now convert the wonderful sari cloths into gorgeous cushion covers, table cloths and napkins. If you are in a rush, they will get them ready for you to take away in your luggage. Seng Hup are amazing upholstery wizards and the whole of China Tiger's cushions, curtains, chair pillows have all been done by them. Businesses like this really allow you to be creative and go home with things that are very individual and special. And ladies, a visit to the 'threader' to shape your eyebrows before you leave is a must do! You can also get the most exotic henna designs painted on your hands, or your feet, if want to be more discreet. Market Street is where all the spice is found. Spice businesses established long ago still thrive and the various sundry shops and small grocery stores supply all the raw ingredients to the local restaurants surrounding us. Everywhere you go you will encounter trollies of food, potatoes, tomatoes, onions and floor being pushed to one restaurant or another. Another supplier to look out for is the 'fresh milk man'. He delivers on his motorbike, plastic bags full of fresh cow's milk for all the Madras coffee drinks served in the Indian restaurants. He also supply's pannier and yogurt. Between Market Street, Penang Street, China Street and King Street you have a whole emporium of shops for sari's, fabrics, tailors, bangles, indian jewelry and Bollywood DVD's. This area is a real bazaar and it is great fun to investigate all the stores and search for a special treasure, whether the perfect cotton kurta, or a wonderful tiara for a dress up party. Indian kitchenware is a special favourite of mine and I totally love the stacked stainless steel tiffin carriers in all sizes. The street food in the area, especially at teatime is wonderful- curry puffs, samosa's, puttu mayam. You name it, you have to try it! Also great are the whole sale shops, my favourite being CAA Trading up the road from us. When you first walk in to see the 'boss' sitting cross legged on the floor surrounded by people and merchandise, it is hard to focus on what he has to sell in there. But, this place is a treasure trove and great for kids to go with RM10 bucks and come out with handful of bits that only they can appreciate. Stock up for kids party hand outs here! During local school holidays, his son is on duty. Only 12 years old, this lad is a real testament to the idea that kids should be allowed to help with the family business. The speed of his calculations and his salesmanship is totally mind boggling and leaves me feeling inadequate. Beach Street is also well worth exploring especially if you hang left at the end of China Street and go down past the fire station. This is the street of wholesalers selling anything from plastic bags, Chinese Tea, Steamer baskets, brooms, kitchen supplies, household supplies, office supplies and fishing tackle. Also down here is the wonderful rotan basket weaver. He has honest, 'Shaker style' beautiful, baskets that are totally covetable and well worth the money. Beach Street, turning left off China Street takes you down towards the elegant large corporate buildings and banks. Many of these are now restored awaiting tenants and the street is now really being returned to it's former glory. Whiteways looks magnificent after its restoration and this stretch looks more and more like the old photos taken in the early party of the 1900's. This is good news for all of us in George Town. Take a late afternoon stroll down towards Weld Quay and the ferry terminal. Here you will find QE11 where you can have a cold beer and the kids can feast on a great pizza. Old Hai Nan Town is also a good restaurant for nyona style food and a view of the marina and the ferries coming in and out. Also in this direction are gorgeous buildings- The George Town Dispensery, Bangunan UAB, Wisma Kastam with its clock tower(easily seen from China Tiger), and the lovely Wisma Yeap Chor Ee. Walk across Chulia Street and make your way to Armenian Street. Visit the majestic Khoo Kongsi but also take time to look at the rows of lovely little houses in the area. these are occupied by local families and keep an eye out for the wonderful bicycle repair shops, and the perm parlours. They take you back to a time when things moved at a slower pace. Do the loop around and do get a meal at Edelweiss- it's German sausages and beer make a good change after days of the flavours of Indian, Nyona and Chinese food. Carnavon Street, takes you across to Kimberly Street and Campbell Street. A must visit on Kimberly Street are the row of pink heritage houses that make up a large temple and religious paraphernalia emporium. lanterns, lights, statues, beautifully packaged incense, teapots are all here, as well as wonderful paper products that can be used as material for any kind of new artwork. Also in the area, the early morning markets are well worth a visit and allows you to see all the local produce. Weekend markets are especially packed full of goods. The morning market on Cintra Street between Kimberly and Campbell Streets are especially vibrant. You can then make your way up to Penang Road(not the same as our Penang Street) where you can go into Chowrasta market and check out the bung full book shop upstairs. This is a very local area to shop. Cheap and cheerful are the key works here. Novelty items, also. Mydine, is a cheap local supermarket, a bit like a local Woolworths's. I love the odd rummage here because again, you can really fine the odd treasure and total bargain. And I have to say, I'm a real sucker for looking at colourful plastic stuff. In abundance it manages to actually look like an art installation. Before the mansions on Gurney Drive or Kelawei Road, there were the townhouse residences on China Street. these were the 'mansions' of their time. China Street, or Lebuh Cina, is today, one of the commercial streets in George Town. It is located within the core zone of the George Town UNESCO World Heritage Site and is right on the edge of Little India. Busy during the weekdays but quiet after office hours and at weekends, it does however, come alive during all the cultural and religious festivals that take place in the city. China Street connects two major roads, Beach Street and Pitt Street, and is intersected by Penang Street, King Street and Queen Street. Land reclamation toward the end of the 19th century extended China Street, creating China Street Ghaut. Today it is identified by the impressive Customs Building and Clock Tower (formerly the Malayan Railway Building) on the Weld Quay end, and the busy Kuan Yin Temple at its head. China Street is one of the oldest streets in George Town and was within the area developed first after Francis Light landed in Penang. It was laid down within a few years of his arrival, as documented on the Popham Map dated 1798. China Street was so named because it was the street of Penang's earliest Chinese traders and the Hokkiens called it Tua Kay (Main Street) because it was laid out by Francis Light with the help of Koh Lay Huan, the Chinese community leader and pioneer settler who had arrived with Francis Light when the latter landed in Penang in 1786. China Street was laid out just after Light Street and Beach Street. Koh Lay Huan brought 500 Chinese from Kedah to settle in Penang and Light appointed him Kapitan China of Penang .The Koh family featured prominently through the 18th and 19th century history of Penang. Koh Seang Tat, the grandson of Koh Lay Huan, presented the Municipal Fountain to the government in the late 19th century, on the occasion of the construction of Town Hall. The Hokkiens and the Cantonese jointly established their earliest place of worship at what was then a mount at the head of China Street. This was the beginning of the Kuan Yin Teng Temple (or Goddess Of Mercy Temple) , the oldest Chinese temple in Penang. With the Kuan Yin Temple at the head of the street, it must have been a lovely sight looking down the street from the sea. China Street used to end at the sea until the end of the 19th century when land reclamation extended China Street, creating China Street Ghaut. George Town's oldest 'elite shophouses' or townhouses are found here on China Street. No. 25 is one of these, important in that it marked the residence of one of the first Chinese immigrants and businessmen to settle here. The house has a second frontage on Lorong Chee Em but this is less impressive today because of extensions made by the neighboring buildings. China Street had many elite residences in its heyday and these houses are still visible now, awaiting restoration by others who would be inclined to live again in this very charming and lively street. One very attractive little house is No. 15, the first 'Tan' (Chinese name) house to be built in George Town. Note: Read all about the history of George Town's streets in 'Streets of George Town, Penang', an illustrated guide to Penang's city streets & historic attractions by Khoo Su Nin. The detail of the Popham Map below is reproduced with the kind permission of Andrew Barber. No 29 is a simple 3 storey building set back off the street. The architecture is in the style of other late 1940 or 1950's buildings that can be seen in the area. On Beach Street there is a similar 2 storey buidling with the same wall finish and 'flagstaff' detail at the top centre of the building. We purchased the building from a Kongsi(clan house) that no longer wanted to deal with the fact that this neglected building had 2 sitting tenants that required lawyers, lawsuits and time to move them. These tenants had been in the building for an age and it would take time and money to clear up the building before anything could move forward. We bought the building without looking inside. At the time it was a reasonable price and we knew it was just a matter of time to get things cleared up. Downstairs a newsagents and bookshop had been there for years refusing to pay rent or to move. Upstairs there was the really nasty problem of a long standing non-rent paying, illegal urban swiftlet house. 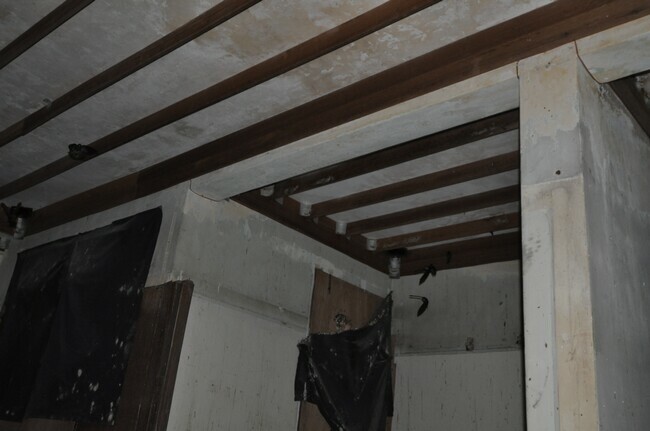 The swiftlet house had caused huge damage by rusting out the main steel beams that provided the main structural props to the building's ground floor. This we had not anticipated. Hoses were left running to keep the inside of the swiftlet house wet and damp to mimic the conditions in a cave. It was this water that caused the damage and of course, there was the health issue of the bird feces on the 2 floors. The newsagent had family on the Mainland and was due to move but basically refused to on the basis of wanting compensation after years of being sitting tenants. This was negotiated and they promptly moved out. The swiftlet house was harder and required legal action against the illegal tenant. Despite no licensing, damage to the building, illegal use of the building, the local council and Government were no help and had not endeavoured to enforce any of its laws. As individuals we had to get our lawyers and together, investigate the options and go through council offices locating by-laws, codes, history of this illegal tenant, etc. then take out lawsuits to try to remove him from the building. It took 1 and a half years of lawsuits going back and forth, with this swiftlet farmer making appeals against us himself, before the court decided that we could take repossession. Even after this it took another 6 months before the court decided in our favour and we won the case. We started work and painted up the ground floor as soon as the newsagent moved out. In part this was to show that we had committed to the building and wanted to improve its condition immediately. The structure was stabilised. This ground floor became my gallery and office and we smartened it up as soon as possible. The space is open and simple and a clearing of the board partitions, a lick of paint and a coloured cement floor was all that was required to give the space back its dignity. We maintained all the metal grill work in the frontage and repainted the metal fold away security doors which I think are charming. Eric retrieved the old tiles on the front of the entrance floor from another site that threw them away. As soon as we received word that we could repossess the 1st and 2nd floors, we moved into the swiftlet house, fumigated and disinfected it completed. We removed all the tubs of feces and took out all the bricks used to block up the windows. Unfortunately some of the original metal and glass windows had been removed but we managed to get them 'copied' in aluminium frames and the same kind of 'bubble' glass, so the facade of the building maintains it's original look. Our financial budget was limited to complete the restoration and we were lucky to find, after clearing out the mess, great open spaces on each floor, with the original bathroom section in tact. We had to leave the windows open for quite a long time to allow the dispersement of all the disinfectant and fumigation chemicals we used and during this time, the swiftlets all homed back into their 'cave'. It was amazing how noisy they were at night when they came back to try to grip to the now clear walls. They were really something out of a horror movie! We had removed all the brick work out of the windows so there was no insulation from the sound of their piercing calls. We solved this problem by hanging netting over the open windows. This kept the birds out of the building. What was slightly amusing was that the swiftlet farm on the next street increased the volume of the recorded swiftlet calls in his houses and apparently managed to attract a number of the birds chucked out of our building. He was happy! We had a band of swiftlet farmers hanging out outside our building for a few days, chit chatting, trying to look threatening and taking photos and video of the birds trying to come back into our building. These pictures were published in the chinese newspapers with quotes such as "You can't get rid of the birds! ", "They'll keep trying to get back in!" etc. etc. We continued with our restoration of this handsome building and after 2 months the birds had dispersed and stopped trying to get in. It didn't take very long for them to do this and it proves that the swiftlets will move and adapt elsewhere. In the meantime we had to sort out doors as all the doors had been ripped out by the swift breeder and chucked away. We managed to find a selection of old wooden doors which we painted cream, fitted with basic old style locks and where there was glass we used the same 'bubble' glass in the original windows. This kept the slightly 'deco' look running through the interior as well. We kept the original metal pull grills at the entrance and half way up the stairs. In the bathrooms we chose a black and white theme and the counter tops are edged with a line of black trim tiles in keeping with the geometric theme. Different size black and white tiles keep it all looking interesting without costing a fortune. We painted, retiled the bathrooms, set up a basic kitchen shelf, re-plumbed the sinks- everything had been ripped out by the swiftlet farmer- put down a painted apoxy floor and then decorated with colour and a real mixture of furniture and fun bits and pieces. The old wooden porch fences hung behind the beds I brought back from Indonesia. Eric, our contractor was a star and managed to locate some great pieces to put into the apartments. He alerted me to all the vintage 'Ladybird' signs and tools, the drum table and the old honest furniture pieces including the great dining tables in both apartments. He also found me the stash of old metal chairs which looked only good enough to throw away when I got them. After washing and rubbing, then re-riveting where needed, painted with anti rust and then spray painted the lovely colours they are now, these chairs are totally covetable! The old kids scooters and bikes on the stairwell walls were all used by our kids and now, too small for them, look great displayed here. I'm constantly on the look out for vintage paraphernalia to add to the stairwell collection. These are now really great feeling apartments that our grown up sons will be very happy to claim when they come back from Uni! In the meantime however, guests can rent them and enjoy this lively part of George Town. We moved into our newly restored home in China Street on February 15th this year. The day after Valentines Day was full of festivals. Chap Goh May, Thaipusam and our contractor Eric's birthday all were celebrated on the 15th. There was fireworks, drums, traffic jams, lots of people, music and the chariot pulled by its beautiful leading bulls. We didn't get much sleep, our 'moving' in was celebrated by all and we have slept well ever since! It has been very, very happy. First I need to give you a bit of background so that you can see how I have formed my opinions and views about living in this area of George Town. Both David and I are Malaysians, both of us growing up on plantations, in amazing old houses. My family moved all over the country, David's lived out at Batu Caves. My mum is from Johore and my dad is British. Originally based in KL, we moved out to Pangkor Island in the early 90's with the idea of giving our own 2 boys a taste of our kind of childhood. Jungle, outdoors, nature, small towns. Pangkor is a fantastic place and we still have our house there and go down to it regularly. The boys went to the Chinese school on the island and Tessa, our little girl was born there. As a family we moved to Penang in mid '99 for David's work and the kids schooling. We felt completely at home here and we quickly decided we wanted to be here permanently. I fell in love with George Town after spending time in the 'Little India' area while researching the spice merchants for the Tropical Spice Garden. We decided that if we could find the right building we would restore and live right in the heritage core. We owe Penang Heritage Trust big time! It was PHT that saved the house we now live in. Without the PHT protest in front of the house in the early 2000's and their insistence that it be saved, there would have not been the derelict merchant's house to attract us to save it. Its double courtyard, extra wide frontage and back entrance onto Lorong Chee Em, its simple and practical design grabbed us as soon as we managed to get access through the hoarding that covered the building for years. David and Eric managed the restoration and building. Gywnn Jenkins documented and recorded the process and after 1 year and 9 months we moved in with the family and haven't looked back. I never thought that it would be this delightful to live here in town. I use the local restaurants, I buy my vegetables, fruit and flowers from the local shops and stalls, tailor clothes around the corner, buy bread and local cakes and sweets from the bicycle stalls that come round at different times, buy the best yogurt from Enrico's, my spices from Market Street and my lovely Bollywood movies from the boisterous shops on Penang Street. I use my old bicycle, I walk, Tessa rollerblades on the Esplanade, rides her bike on the padang and we watch modest cricket games between the Indian foreign workers sometimes early on Sundays. I also drink way too much masala tea and eat too many times at the Sri Ananda Bhawan restaurants on Penang Street. We have become part of the community here and it's a great feeling walking down the street and being able to say 'morning' to lots of people from very different backgrounds. I am thankful for the council road sweepers and cleaners who, by the time I open the door at 7.15am, have cleared away all the rubbish each day, swept the street clean and cleared the drains. These men work thanklessly doing their jobs each day. Then there are the surprises. At the end of the nine days of Hindu vegetarian fasting, on the 28th of September this year, the chariot appeared after the sound of drums. Dancers, not just a few but a hundred, come down the street dancing with sticks, crowds come to the chariot, families, individuals offering trays of fruit to the holy chariot with flowers returned in thanks. You suddenly realise that all around you here in George Town people are living very quietly and on days like this they get cleaned up, put on smart clothes and come to give offerings on the side of the streets. It is wonderful. Each time this happens our upstairs shutters overlooking China Street are opened and we spend our time hanging out and watching the show. Earlier on the 8th of September I had gone out at about 9.30 pm to water my bamboo at the front of the house. I opened my doors to see a vision of metallic papers scattered all the way down China Street. When cars came driving down the effect was magical as the breeze tossed these metallic papers into the air and up into the street lights. It was beautiful and yet I had no idea, no inkling at all, that people had obviously gone by in some sort of vehicle tossing out piles of metallic paper money all over the street for Cheng Beng. For me, as someone who has the made the deliberate move to live in the inner city, all of this activity is an eye opener. It is something I enjoy and learn from and I find it all fascinating. I am reminded of my childhood all the time here and because it was so happy, this place makes those memories come alive for me. I am also thrilled that my own kids can still experience some of these traditions before they do die out or are forgotten. This is the beauty of George Town. So much of it is simply taken for granted and because of that, it's value is not realised. This kind of value is often not counted until it is gone forever and more often than not , it is remembered with regret, at not having been more appreciative of it all at the time. There are far more tourists in George Town since the UNESCO listing, there is far more traffic in town, there is lots of property exchanging hands, new people are moving in, old people are moving out, new restaurants, loads of boutique hotels! There are lots of issues that need to be dealt with. ( My pet issue being the absolute menace of the swift breeding that is taking over George Town. Please read my separate opinion and account on this. It is a big issue that has to be highlighted separately.) Not all these issues are bad. George Town has always been a place where the world meets, where products are brought, where people immigrate to, where things are exchanged. With the UNESCO listing George Town has been offered a chance to revitalise itself and to realise its value once again on the world stage. It's wealth is in its heritage and its people and I cannot tell you how much I appreciate this on a daily basis living here in the core zone. With this column I hope to introduce you to some of the local characters that I see and meet on the streets, some of the issues both good and bad that need to be highlighted.